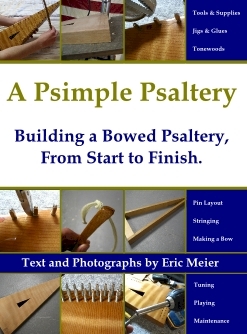 Designing a bowed psaltery (or any musical instrument for that matter) requires you to be a bit of a scientist, or even a bit of a physicist at times. While not everyone likes this aspect of lutherie, (usually those that like to stick strictly to the prescribed plans), I tend to enjoy this “research and development” phase. Accordingly, one thing that is very helpful is knowing the density of a material. How well will it resonate a musical vibration? How will it stand up to wear? This table is not meant to be exhaustive, nor is it to be seen as authoritative. For instance, there are many different types of aluminum alloys, and while I could list something like: “Aluminum 1100, Aluminum 3003, Aluminum 6061, etc.” I’ve instead chosen to simplify things and simply write a good representative number for each material as a whole. I’ve intended for this table to be used to get a broad overview of materials, and how their densities relate to each other, and not as an in-depth and ultra-precise reference guide. But as an ongoing project, I’ve begun The Wood Database, which is a much more exhaustive and thorough examination of all the different wood species, including data on hardness, strength, density, etc.